A display of mental strength and intelligence is under way in the first World Mind Sports Games in Beijing. Nearly 4,000 competitors and officials from 143 countries and regions are taking part in the two-week event. The Games come as China celebrated earlier in the week its success in hosting the Olympic Games and Paralympics. The world has marvelled at the physical achievements of the Olympians and Paralympians this summer in Beijing. Over the next two weeks, nearly 3,000 challengers will be competing for 35 gold medals in five events - bridge, chess and draughts, Go and Xiangqi or Chinese chess. It is a mixed variety of hugely popular board and card games from the East and West. 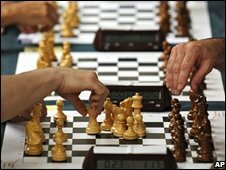 Chess and bridge, which originated in the West, now have 400 million players across five continents. Chinese chess is played by 200 million players in 20 countries. The game of Go, invented in China more than 3,000 years ago, now boasts 60 million players in five continents, mostly in China, Japan, and South Korea. Top players have become idols in these countries. Delegations have been asked to bring water - symbolising the source of human spirit - from their homeland to Beijing, to mix together. At the end of the games, they will be able to bring home a small sample, symbolic of the combined wisdom of the world. China was top of the gold medal table for the Olympics, and it hopes to achieve the same feat in this first ever mental sports competition.